Steven Greenhouse, the labor and workplace reporter for The New York Times, published an article yesterday portraying the rising tension between the European- and American-led garment multinationals in resolving workers’ issues. Boston Global Forum is honored to support Steve’s research when inviting him to join our Online Conference on November 18th, 2013. Tensions broke into the open on Monday involving two large groups of retailers — one overwhelmingly American, the other dominated by Europeans — that have formed to improve factory safety in Bangladesh. An official from the European group voiced concern that the American retailers would piggyback at no cost on the efforts of the Europeans — which includes H&M, Carrefour and more than 100 other retailers — in financing safety upgrades at hundreds of factories. The members of the European-led group, the Accord on Fire and Building Safety in Bangladesh, have made binding commitments to help pay for fire safety measures and building upgrades when shortcomings in safety are found in the more than 1,600 garment factories its members use in Bangladesh. While the American-dominated group, which has 26 members, including Walmart Stores, Target and Gap, has stopped short of making such a binding commitment, it has pledged to provide loans for the improvements. Jeff R. Krilla, the president of the American-dominated group, the Alliance for Bangladesh Worker Safety, said he was surprised by the criticism, noting that his alliance had agreed to make $100 million in low-cost loans available to Bangladesh factory owners to finance safety improvements. In a sharp exchange in a telephone conference call on worker safety in Bangladesh that was organized by the Boston Global Forum, a nonprofit research organization, Mr. Krilla said his group’s members were making a significant financial commitment to improving safety, including a total of $50 million over five years in contributions by retailers in the alliance. The two groups, founded after the Rana Plaza factory building collapsed last April, killing more than 1,100 workers, are just beginning factory inspections. Despite the friction, they have been working closely together to develop joint inspection standards on fire and building safety. 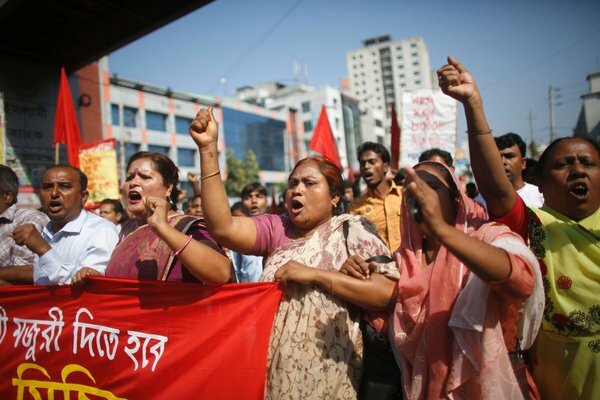 Srinivas B. Reddy, director of the International Labor Organization’s office in Bangladesh, described a change in attitude among Bangladesh factory owners who have frequently been criticized by the United States and other countries for shunning safety concerns and suppressing labor unions. “The factory owners in Bangladesh have clearly realized that unless these issues are addressed in terms of improving safety and labor rights, the industry may land in crisis,” Mr. Reddy said. That could lead to the loss of orders from Western companies. Bangladesh is the world’s second-largest garment exporting nation after China, exporting nearly $20 billion in apparel each year. In the conference call, Mr. Nova, in a clear reference to the American-led alliance, said that members were concerned about “the tremendous lack of worker involvement” in some factory safety efforts. The European-led accord has two giant union federations as members with tens of millions of members, IndustriALL and Uni Global. The American alliance does not have any formal union participation, but Mr. Krilla said his alliance expected to work closely with Bangladeshi unions. In recent months, Walmart, H&M and other retailers have sponsored their own emergency safety inspections of factories, in part to prevent any new disasters before inspections called for in the groups’ accord begin at hundreds of factories. Late Sunday, Walmart posted on its website the results of 75 inspections that it commissioned for factories it uses in Bangladesh. Mr. Gardner said that 34 of the 75 factories had moved from having a D or C rating to having an A or B rating. In a separate interview, Mr. Nova criticized Walmart’s inspection reports as inadequate.